Can Tourism and the Arts Save a Struggling Delta Town? Along Highway 61’s strand of tired, worn buildings and washed-out towns, Wilson, Arkansas first appears as a grove of trees on the horizon straight ahead in the flat, Delta landscape. Only when entering does it prove to be a town, and a bizarre oasis of a town at that, with its anachronistic British Tudor architecture, its beautifully-landscaped square and streets, its appearance of prosperity in the midst of the deprivation that characterizes the Arkansas Delta. One might imagine that such a village is mystical, perhaps like the mythical Brigadoon that only appeared every hundred years or so. But Wilson, Arkansas is a real place, its difference caused by its unique history as a company town. Robert E. Lee Wilson was just a boy in Tipton County, Tennessee when both of his parents died. Forced to become a man at an early age, he ended up cutting timber for a sawmill in Eastern Arkansas, a place where death from injury and disease was common. Beating the odds, Wilson saved enough money to buy some swampy timberland in southern Mississippi County, Arkansas, across a former Mississippi River channel from the island town of Reverie, Tennessee. In order to process the timber he cut, he founded a sawmill town he called Wilson, around the dawn of the 20th Century. That town of Wilson was subject to flooding, and Wilson soon decided that it needed to be relocated further inland. The new town was a model town in every regard, patterned around a well-landscaped square, with a car dealership, tavern, store, gas station, and railroad, all owned by Lee Wilson & Company. Once the timber had been cut, Wilson had turned to agriculture, growing cotton across vast acreages. When existing railroads tried to charge Wilson outrageous prices, or would not schedule trains that met his needs, he built his own railroads, the Delta Valley and Southern and the Jonesboro, Lake City & Eastern. While the town of Wilson was always his crown jewel, he founded other towns as well, Evadale, Marie, Delpro, Keiser and Armorel (the latter was said to be named for Arkansas, Missouri and “R.E.L. Wilson”). Even the Great Depression was no mountain to climb for Robert E. Lee Wilson. Although he paid his employees in scrip redeemable only at the company-owned businesses, they didn’t starve, and Wilson drew the largest check in the history of Memphis’ Union Planters Bank during the 1930’s. But cotton could not remain king forever. The Lee Wilson company diversified, acquiring holdings in Utah and other parts of the country, and several generations of the Wilson family ran things from the company headquarters in Arkansas, but more and more the business was turning down offers from would-be buyers eager to acquire the vast amounts of land held by the company. Finally, in 2010, the Wilson family agreed to sell. One of the great fears was that any purchaser of the company’s land and holdings would not be interested in the town that went along with the purchase, a fear that initially proved to be true. Gaylon Lawrence Jr, the multi-millionaire who paid $110 million for the Wilson company and its land had little need for a town in the Arkansas Delta, and originally planned to sell it off. But after visiting it, he decided to try something else, hiring an architect and academic from Nashville named John Faulkner to act as a city manager for the Town of Wilson. The Wilson Cafe has reopened as a farm-to-table restaurant, with many of the vegetable coming from the nearby Wilson Gardens. A private school called the Delta School has been opened in one of the Wilson family mansions, and a concert series has been started. One of Johnny Cash’s relatives has opened White’s Mercantile in a former service station on Highway 61, a branch of a store of the same name in Nashville. On a recent Sunday afternoon, the shelves were full of colorful and unique items, and the shop was full of browsers, many of them just having come from lunch at the Wilson Cafe. The address of the store, 17 Cortez Kennedy Avenue, reveals another recent change, the renaming of Highway 61 for Wilson’s most famous native son, a star NFL football player who died earlier this year. A museum of Native American artifacts dug up at the Nodena site near the Mississippi River is under construction on the square. More plans are being discussed, including one that would turn the large office building east of the railroad tracks into a luxury hotel. But of course, it is all too early to tell if any of this planning will make any real difference in the town stuck in the middle of a region of persistent poverty and outmigration. But the effort to save such a unique town should be applauded, and Wilson is an experience not to be missed. There are currently no hotel rooms in Wilson, but rooms are available nearby in Marion or Osceola. A few years ago, when I visited the Backstreet Cultural Museum in Treme, I was unaware of the existence of another museum dedicated to the African-American cultural practices of the Lower Ninth Ward. Indeed, Ronald Lewis’ amazing House of Dance and Feathers, located in the back yard of his residence, was nearly destroyed by the flood waters of Hurricane Katrina, and many priceless artifacts were lost, but volunteers and donors helped rebuild the museum and restock it with photographs and objects that preserve a record of the neighborhood’s unique culture, a culture that at times seems more Caribbean than American. When the Neighborhood Story Project published a beautiful book about the museum, many people around the world (including myself)became more aware of the great work that Lewis has done to preserve a record of the Lower Ninth Ward and its significance to New Orleans as a whole. The museum contains artifacts of Black Indian culture, of social aid and pleasure clubs, and of brass bands and musicians. It also contains articles and books that deal with the history of New Orleans and related Afro-Caribbean cultural practices which resemble those of New Orleans, such as those of the Garifuna people of Central America. Mr. Lewis was very gracious in opening up the facility for me, his only visitor on the afternoon I was there, and explaining many things to me. A visit to the House of Dance and Feathers (as well as the Backstreet Cultural Museum) is a good place to begin to get an understanding of the culture which produced jazz, brass band music, R & B and even bounce music. 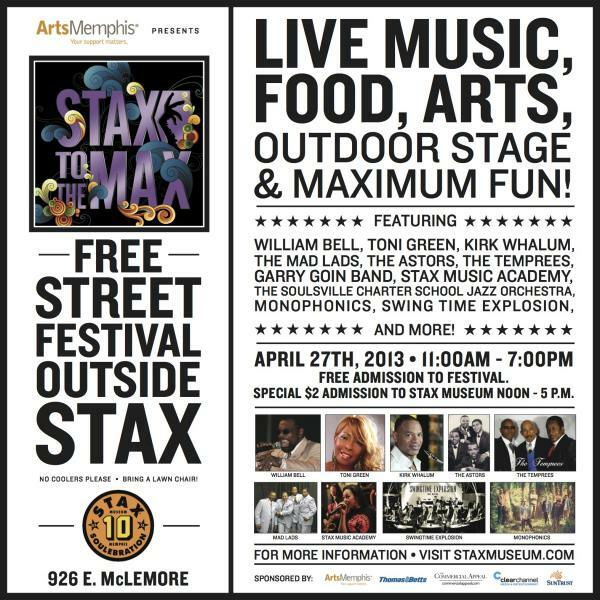 Also on Saturday’s busy day is ArtsMemphis’ Stax to the Max festival, featuring the appearance of three classic Memphis soul vocal groups The Temprees, The Mad Lads and The Astors, all of whom recorded for Stax back in the day. Although I was unable to get a detailed schedule, the flyer indicates who will appear. Richard “Rip” Lee Pryor is the son of the late Chicago bluesman Snooky Pryor who himself was from Lambert, Mississippi in nearby Quitman County. Like his father, Rip is a harmonica player and guitarist, and he thrilled the modest crowd outside Clarksdale’s Rock & Blues Museum during Juke Joint Festival on Saturday. The museum is worth a visit, not only for the exhibits, but also for the good selection of used vinyl and compact discs that are for sale. The B.B. King Museum in the famous bluesman’s hometown of Indianola, Mississippi states that its purpose is to promote the values of B. B. King, but it has also promoted an increase in tourism to what was a sleepy Delta town. The live music outdoors that motivated me to drive down from Memphis was sponsored by the museum, and the museum has now assumed control of the historic Club Ebony, located just to the southwest of the museum campus.